Back on August the 12th I wrote about having tried a sample of Old Bay seasoning, liking it, and then finding that Costco no longer carried it. Well later that day, I received an e-mail from someone who works for Old Bay's PR firm. I suppose they must use search bots to locate and then read all the pages on the world wide web that make mention of their clients products, and my little blog page came up. In light of it being Old Bay's 70th anniversary this year, as well as the fact that the seasoning was gone from my Costco when I went to buy it, this person offered to send me an Old Bay gift bag! Heck, who am I to refuse an offer like that? A couple days later, a box arrived in the mail. Inside of it was: an Old Bay drawstring shoulder bag; Old Bay beach towel; a 6 oz box of their seasoning; a package of their steamer bag and seasoning mix; a keychain; a decal/tatoo; and a folder with some recipes in it. Nice! What a generous gesture. I showed it to Julie and she's like, "How come you get all this free stuff??" By that she was referring not only to the Old Bay package but the things I get to review from being a part of Amazon Vine. I told her, it's because she doesn't write, that's why.. Anyway, I've already used the seasoning a couple of times. Once on some pan-fried tilipia, which turned out yummy, and then tonight, on some shrimp and veggies. Got out the Old Bay, compliments of the PR firm. After the pan was heated so it would sizzle drops of water, I put the chopped sun dried tomatoes in it and moved them around so that the seasoned olive oil would cover the pan. I added the squash and sauteed it for a while. 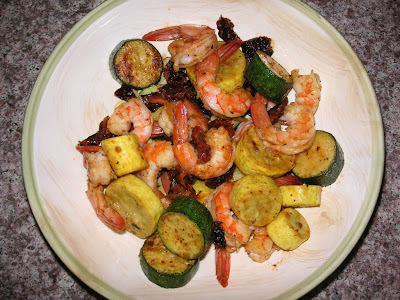 Last, I added the shrimp to saute. Then I added a lot of Old Bay to everything (well, I tried not to add TOO much since it does have salt in it). And that's it. I just mixed it all up and then unloaded it into the dish so I could take the picture that you see above. We had it with some spinach and basil fettucine from Trader Joe's and a nice crusty La Brea Bakery demi-baguette from Costco. Mmmm... delicious. Now the reason I keep mentioning Costco and TJ's is not with the expectation that they'll run across my post and send me some freebies (if I thought that, I would write about Porsches or something like that), but because that will show you I pretty much subsist on things bought from those two stores. And I really appreciate the Old Bay, too! How long do you have to wait until the search bots find my posting and send me a OLD BAY gift bag? Well since you are "anonymous" I will have to accept any gifts on your behalf.. and I guess I will have to keep it since you're anonymous, lol..